On January 18, the final board meeting of Tatarstan Investment Development Agency «On results of the Agency's work in 2018 and tasks for 2019» was held in «Korston Club Hotel Kazan». Head of Tatarstan Investment Development Agency Taliya Minullina, Chairman of the State Council of Tatarstan Republic Farid Mukhametshin, Chairman of the Public Chamber of the Republic of Tatarstan Anatoly Fomin, Director General of SEZ «Alabuga» Timur Shagivaleev, Director of the macro-regional branch «Volga» of PJSC «Rostelecom» Alexey Mironov, Head of the Division on Globalization and Development Strategies of the United Nations Conference on Trade and Development (UNCTAD) Igor Paunovic spoke at the meeting. The event was opened with a keynote address by Taliya Minullina. The Head of the Agency began her speech positively, reporting that the experience of Tatarstan in the development of international and interregional relations is highly appreciated by the Ministry of Foreign Affairs of Russia, which sets this activity of the republic as an example to other regions. The dynamic growth of economic ties clearly reflects the economic indicators: according to estimates, in 2018, the growth of foreign trade turnover of Tatarstan reached 12 percent, and its volume amounted to 19 billion US dollars. - It is too early to sum up the volume of investments in fixed assets, but we are confident that we will be able to maintain the level of the last year, - over 600 billion roubles. Federal trend is in decrease of foreign investment of 15-20%, but in Tatarstan, on the contrary, we see growth. For 9 months of 2018, we have already exceeded the adjusted annual investment for 2017, - Taliya Minullina noticed. - Politics, of course, is interesting, but apparently the economic opportunities of Tatarstan work wonders: in 2018, the companies from the USA took the first place in terms of investment in the projects on the territory of the republic. The second place was taken by Germany due to close cooperation with KAMAZ. Turkey is on the third place. Companies from Turkey and the USA – «Ford», «3M», «Sunrise», «Kastamonu», «Hayat Kimya» - carried out the largest reinvestment. The next is China, which has all chances to break into the top three later. In 2018, foreign entrepreneurs invested in the republican processing industry, financial and insurance sector, scientific and technical activities and construction. According to Taliya Minullina, the agricultural sector has great investment potential. Working with investors is particularly relevant for districts which have no sites with federal tax benefits and preferences. But not all the districts use their resources to attract investment. To create a complete picture of their activity and opportunities and demonstrate it to investors, the Agency has developed an integrated rating of investment attractiveness of the Republican municipalities, the first official results of which will be announced in March 2019. The rating consists of two sub-ratings. The first one shows a specific result and includes such indicators as the volume of foreign investment per resident, the number of registered companies with participation of foreign capital, the number of companies registered in other regions of Russia which invested in the district. The second reflects the results of positioning the municipality as an investment site, including the number of publications on investment sites, projects, etc. - We already have some data for the rating. For example, the first place among municipalities in terms of foreign investment (almost 1,5 thousand US dollars per capita) is occupied by Elabuga district. At the same time, the district shows weak activity in the second sub-rating. Naberezhnye Chelny is doing excellent with the «advanced development territory» regime: 15 billion rubles have already been invested. According to the indicators of the Ministry of economic development of Russia, the Chelny ADT was supposed to attract 30 residents till the end of 2019, and by the end of 2018 it already has 30 of them, - Taliya Minullina reported. - The Executive Committee of the city has already posted twice as much publications on its website, than the Executive Committee of Kazan. But Kazan is using social networks actively. Bugulminsky, Mendeleevsky, Kukmorsky, Drozhzhanovsky and Muslyumovsky districts are actively promoting itself in social media. Almetyevsk and Arsky districts, which have no SEZ and ADT are effectively working in this direction. At the same time, Zelenodolsk and Chistopol, where the ADZ regime operates, are among outsiders in terms of publications about their work. We will cope together in 2019. Among the tasks for 2019, Taliya Minullina also called the work on improvement of the position of the Republic in the National Rating for the Investment Climate of the entities (in 2018, Tatarstan took the 3rd place, conceding first time to Tyumen and Moscow). - An agreement on the construction of a multifunctional hotel complex near «Kazan Expo» with the cost of 2 billion roubles was signed. The development of the project documentation is designed, the investor is Russian, - Taliya Minullina observed. According to the Head of Tatarstan Investment Development Agency, another 2-billion project - Castorama shopping center, which was opened in April 2018 - may change its owner. - According to statistics for 2018, every three days a new company with foreign capital is registered in Tatarstan. At least once a week we receive a new project. This shows that our climate is very favourable. But it is created mainly by 10 municipalities, Kazan is an undoubted leader among them. In 2018, 232 new companies with foreign capital were registered in the city, – the Head of the Agency remarked. Over the past year, 5 meetings of the Investment Council of Tatarstan were held. The total amount of investment under the approved applications amounted to 29,5 billion rubles. A significant part of the Agency's work is devoted to the organization and conduction of meetings with existing and potential investors, as well as the organization of events at the national, federal and international levels. Thus, in February 2018 at the «World Mobile Congress» forum Taliya Minullina took part in the signing of the agreement between Tatarstan Investment Development Agency and Ericsson and MTS companies on the opening of the scientific and research center in Innopolis to create and launch innovative products and solutions based on 5G and IoT (Internet of Things) technologies to the Russian and global markets. The centre was opened in April of that year. The Schneider Electric Innovation Center was also opened in Innopolis with the direct participation of the Agency. The next part of the report was devoted to the impact of communications in the enhancing investment attractiveness of the region in a variety of areas. - In 2018, it turned out that I'm nice with football: I have visited all the FIFA World Cup matches in Kazan. We have organized the championship for businessmen-fans and business missions of foreign companies, 11 projects grew out of this work, – Taliya Minullina indicated. - Two of them are the loading of existing in Tatarstan productions with new order. It is important for us that new partners are not only competitors, but also allies of our local producers. Previously, we were mainly engaged in attracting investments, but now, having studied the markets and best practices, we see the need in support of those republican enterprises that have become investors themselves. The Head of the Agency mentioned the creation of a database of publications in foreign languages about Tatarstan and its investment projects. The relevant section will be created on the investment portal of Tatarstan Investment Development Agency. - Still, the foreign investor trusts the information of the resources known to him, - Taliya Minullina commented on the innovation. In addition, where previously 11 language versions of the portal broadcast the same content, in 2019 foreign visitors will be able to see relevant materials about business events on the territory of Tatarstan which were attended by companies from their countries. Priority tasks for 2019 for the Agency will be the increase of the volume of investments in the economy of the republic, loading of ADTs with residents, primarily in Nizhnekamsk, support to areas that do not have federal benefits, improving the efficiency of industrial sites, further implementation of PPP projects, implementation of opportunities for establishing contacts within the International Championship for Working Professions WorldSkills-2019, targeted work with the investors club. - In General, I am satisfied with the Agency's work, but we can work even better. I thank the staff. Thank you to all the participants of the investment activities that we carry out together, - for the benefit each Tatarstan citizen and improvement of the quality of life in the republic, - Taliya Minullina concluded. Next speaker, the Chairman of the Public Chamber of the Republic of Tatarstan Anatoly Fomin emphasized that the activity of Tatarstan Investment Development Agency is important for society and deserves wide information coverage. In our opinion, the creation of the Agency has fully proven itself. A team of skilled professionals has been formed, and surely, they contribute to the development of the republic. I have to say, from the very beginning Taliya Minullina became actively involved in the public outreach, - Anatoly Fomin pointed out. He recalled the initiative of the Head of the Agency, which led to creation in the Public Chamber of the assessment system for regulations and projects developed by the Agency as a public authority responsible for the management of the investment process in the republic. The Agency's contribution to the implementation of the republican Strategy-2030 and 38 social programs operating on the territory of Tatarstan is great. Anatoly Fomin emphasized the importance of social projects, the support of which is part of the republican investment process. - In 2018, over 100 republican non-profit civil associations received grants for a total of 150 million rubles. The Cabinet of Ministers of Tatarstan signed an agreement with the World Bank on the implementation of some projects, it also says a lot, – said the Chairman of the Public Chamber. Anatoly Fomin reminded that social fairs are held in Tatarstan. The fair become the platforms where the government, business and society seek and find opportunities for the implementation of social initiatives. - We must inform citizens about ongoing projects better, especially in the social sphere. We are ready to cooperate in it with the Agency, and I'm sure we will achieve result, – the speaker concluded. In response to the wishes of the Head of the Public Chamber of Tatarstan, Taliya Minullina reported that the Agency will include the promotion of social projects, social fairs and social entrepreneurship in its list of tasks for 2019. The theme of social responsibility was continued by the Director General of SEZ «Alabuga» Timur Shagivaleev. - Plants do not represent an end in themselves. New production is a source of taxes and wages. And our mission is to create the best conditions for the domestic industry, – he said at the beginning of his speech. Further report confirmed that the mission announced by the SEZ Director is not formal, but quite applied. In 2018, SEZ Alabuga was recognized the winner in the category "New investments" of the rating of special economic zones, compiled by the publication of the Financial Times group. «Alabuga» is the first in the rating of Russian special economic zones. It is recognized as an effective and self-supporting by the Accounts Chamber of the Russian Federation, and became the largest participant in the Federal program of support to industrial parks and technoparks, having received 1 billion subsidies from the federal budget in 2018. Now the SEZ houses 30 existing production facilities, the revenue of residents is 82 billion rubles, more than 6,8 thousand jobs were created, the actual investment reached 123,4 billion rubles. New investments of residents in 2018 amounted to 10 billion rubles. 7 new plants have been opened. Three companies – "Coskunoz Alabuga", "Hayat Kimya" and "Rockwool" – expanded their production. - Reinvestment is a very important indicator of the quality of the environment, – Timur Shagivaleev commented on the announced figures. In 2019, several new enterprises are planned to be opened - "August" company plant (new manufacturing technology of plant protection agents), "Transneft-Synthesis" (production of anti-turbulent additives), "TN" (production of one-component polyurethane fixing foam), "IGS Agro" (cultivation of champignon mushrooms, production of compost and humus), "Inko-Tek Agro" (mineral fertilizers production), "KNT-Plast" (production of PVC compounds and PVC films), "Tatcement" (production of modified cement). In addition, in 2019, it is planned to complete the construction of a strategic facility not only for the republican, but also for the Russian industry on the basis of the "Alabuga-fiber" plant - the production of PAN-precursors, which is a key component for the production of carbon fiber (a joint project with "Rosatom" state corporation). In addition, the construction of the second stage of "Synergy" industrial park will be completed in 2019. One of the key tasks for «Alabuga» for this year is the preparation of the required number of specialists, first of all - mechatronics, Automatic Process Control System technicians, electrical engineers, chemical engineers. Qualification of «Alabuga» in the field of professional training is confirmed by the certificate of the IB international educational program and the diploma of the Agency for strategic initiatives for the best project on personnel development. Taliya Minullina asked Timur Shagivaleev how he perceives the success of rapidly developing ADT in Naberezhnye Chelny. - It's great that the level of support for manufacturers is getting better. The investor can get good conditions anywhere in the republic. It's nice to see how all the forms of cooperation are developing, - added the head of the site which previously was the only to provide federal tax preferences. The priority of work related to the social sphere was also stressed by the Director of the macro-regional branch «Volga2 of PJSC «Rostelecom» Andrey Mironov. In 2017-2018, the company implemented 4 large-scale projects. Investment of PJSC «Rostelecom» is these projects amounted to 150 million roubles. The company carried out the modernization of outdoor lighting systems in Mendeleevsk, Yelabuga and Zelenodolsk and the project on equipping with communal meters of heating and hot water supply in Zelenodolsk. The result affected on the amounts in receipts for housing and public utilities, which decreased significantly. - In addition, the modernization of the lighting system reduces the level of criminality in the cities. The probabilities of crime are less in lit up areas, - the speaker noted. Now the company cooperates with the Zelenodolsk enterprise of heating networks on installation of 60 thousand electricity meters and automated data collection systems. The customer is JSC «Network company». Rostelecom's investments in the project will amount to 1,5 billion rubles. Speaking about the plans for 2019, Andrey Mironov said that the company is ready to implement several major projects in Tatarstan. Rostelecom is ready to invest 300 million rubles in the modernization of outdoor lighting systems in Naberezhnye Chelny and Almetyevsk (projects designed together with Tatarstan Investment Development Agency). The Director of the macro-regional branch «Volga» expressed hope that a similar project will be approved by the Kazan city hall, as well as the heads of other cities of the republic. According to Mironov, the reduction in electricity costs at already modernized facilities amounted to 72-73%. Another prospect that the company is actively discussing with the Agency is the installation of metering devices and «smart» stops in Elabuga. «Rostelecom» is ready to invest at least 250 million rubles in bus stops. - It is good to have investments, and when investments bring high-tech solutions that make life in Tatarstan more comfortable, solutions that can stimulate economic development, economic activity of small and medium-sized enterpreneurship. «Rostelecom» is the member, who brings smart investment. We count on support of Tatarstan Investment Development Agency and joint constructive work with you, – Andrey Mironov concluded his speech. - From the crisis period of 2007-2008 till 2017, the economy grew slowly, and in 2017-2018 the growth was about 3%, which is comparable to the previous decade. But the economic growth that has been synchronized around the world recently may not last. A slowdown will take part in different parts of the world. It is hard to predict, but we can say that the probability of a crisis in 2019-2020 is much higher than in 2018. I would recommend officials to prepare for the possibility of a crisis and to work on increase of stability in the areas entrusted to them, – said Igor Paunovic. - Due to a number of deep structural problems of the global economy, the coming crisis may be larger than in 2008-2009. Fortunately, Tatarstan has a very active government that promotes the economy and social development, which means that it will be active even in case of a crisis in the next two years. Concluding his speech, Igor Paunovic pointed out that Tatarstan Investment Development Agency is the only in Russia to have won the United Nations Investment Promotion Award for outstanding achievements in promoting investment in sectors that will bring social and economic benefits and help countries to achieve sustainable development goals. The Agency's experience proves that the combination of high motivation of the leadership of the state body and the willingness of the government of the region to listen to the needs of the population can lead to incredible results. - Taliya, the Agency, keep doing your work effectively! - Igor Paunovic concluded. On the same day, Korston hosted his lecture, which ended with a session of answers and questions. Chairman of the State Council of Tatarstan Republic Farid Mukhametshin in his report touched upon the republican economic trends. At the beginning of his speech, he reported that the President of Tatarstan Rustam Minnikhanov gives a positive assessment of the annual activities of ministries and departments in various areas of development of the republic, and noted that the coordinated work allows Tatarstan to achieve success even in unfavorable conditions for investment. - We are quite a developed region of a multi-vector economy, we have oil, petrochemical industries, machine engineering and many others. We have a developed sectoral database, which raises interest of foreign investors. And it is necessary to take advantage of it, - Farid Mukhametshin indicated. Highlighting the Agency's special role in promoting Tatarstan in the international arena, Farid Mukhametshin recommended the governmental body to pay attention to numerous industrial sites, as well as the agricultural sector. - There are agricultural areas with the potential for investment. We produce a very large number of agricultural products, more than 5 million tons of grain, more than 3 million tons of milk, we are the first in the country by milk yield. And today this potential can be «promoted», - Chairman of the State Council marked. Then he reminded that Tatarstan is losing its position in the federal rating on the level of public-private partnership: the republic has dropped from the 8 to the 15 place. Serious projects are not enough. Participation of private capital in the projects of our republic is very large. We must turn to the experience of Moscow. They economically stimulate this initiative, which is further implemented in the concession agreement on PPP. The status of the investment project of Moscow allows the investor to receive the measures of state support - reduction of the tax rate, installments on rent, providing a guarantee of compensation to the subjects of investment activity. We'll think about it. Initiatives in this part will be immediately considered in the state authorities of the Tatarstan and certainly supported, – said Farid Mukhametshin. He stressed that the leadership of the republic is making efforts not only to attract investment in the economy of the region, but also to create conditions that stimulate this process. - Restrictions related to changes in regulatory and tax conditions hinder investors' activities. We believe, it is necessary to adopt the separate federal law providing protection and encouragement of investments, establishment of a guarantee and stability of regulatory and tax conditions of implementation of investment projects, – Farid Mukhametshin told. - In December last year, within the framework of the days of the Republic of Tatarstan in the Federation Council, we made this initiative at the meeting of the committee of the Council on economic policy. This proposal was accepted. The draft of this law is recommended to be submitted to the State Duma by the government. Summing up the report, the Chairman of the State Council reminded that in turbulent economic times, in conditions of sanctions and growing competition in foreign markets, it is important not just to maintain, but also to attract new investors. - I want to thank all of you for this great work, one of the most important in the economic sphere of our Republic, and wish us all great success, - Farid Mukhametshin concluded. Taliya Minullina thanked the Chairman of the State Council of Tatarstan for his unwavering support to the Agency. 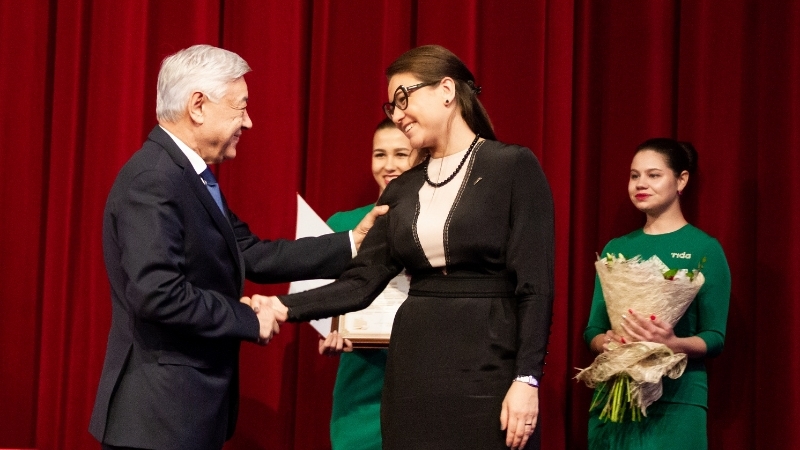 A letter of gratitude for the significant contribution to the social and economic development of the Republic of Tatarstan from the Chairman of the State Council of the Republic of Tatarstan Farid Mukhametshin was presented to Taliya Minullina. The medal of the republic of Tatarstan «For meritorious labor» for merits in financial and economic activity and long-term fruitful work was awarded to the Director of the Tatarstan regional branch of joint-stock company «Russian Agricultural Bank» Lyalya Kudermetova. Taliya Minullina presented letters of gratitude of the Head of Tatarstan Investment Development Agency to the staff of LLC «Kamastal» in the person of the CEO of the company Alevtina Kuzmina and Director General of LLC «Coşkunöz Alabuga» Ecevit Oktem. Head of Financial Accounting and Public Procurement Department of Tatarstan investment Development Agency Margarita Bikmukhametova and Head of Information and Analysis Department of Tatarstan Investment Development Agency Marina Epifanceva were awarded with the Honorary certificate of Tatarstan Investment Development Agency. After that, Taliya Minullina and the First Deputy Chairman of the Board of PJSC «AK BARS» Bank Radik Salyakhutdinov presented certificates to the winners of the social contest #InvestInTatarstan2019, held by the Agency in December 2018 to promote Tatarstan and increase the involvement of users of social networks in investment processes. The general partner of the project was «AK BARS» Bank. The winners of the contest were Liliya Badertdinova («Best video»), Aigul Edutova («Best photo») and Zaliya Fazulzyanova («Best boomerang»). - The tasks announced at the Board are large-scale and serious. Solving them, we must, due to the specifics of our activities, take into account not only the internal resources and needs of the republic, but also external factors. First of all, the changeability of the global economic climate, which Mr. Paunovic spoke about. Moreover, the Agency in its work should focus on the future, on the development of the areas which will help to raise world's interest in Tatarstan tomorrow, - Taliya Minullina commented on the results of the meeting. - It is not easy to combine all this. In addition, traditionally we plan to organize a huge number of events, the main of which is the International Economic Forum «KazanSummit» in April. But the importance of our mission is to promote Tatarstan as a region that represents the best opportunities in Russia, and the degree of trust that the government of the Republic and its citizens give us inspires us to achieve the maximum, sometimes impossible, result. This is how we will work in 2019.